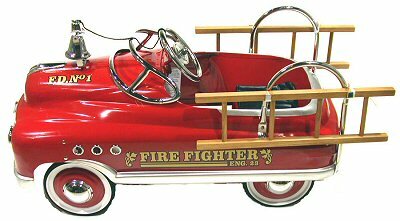 Fire Fighter-themed Comet Pedal Car features a padded seat for comfort, chrome hood, chrome windshield, chrome headlights, chrome grill ornaments, chrome steering wheel, chrome portholes and hubcaps. Includes a working bell. Sealed bearing pedal mechanism with 5 position pedal adjustments to suit 3 to 7 yrs of age. All metal - steel construction with solid Duralast rubber tyres. Safety tested & approved. Fully assembled when delivered. Dimensions: 39" long, 17" wide, 21" tall (99 x 43 x 53cm).